A fairly deep frontal depression had left 30 plus knots of wind dying to 16 kts or less for Saturday afternoon racing at Flushing Sailing Club. The Race Officer Jack Penty had a disappointing 9-boat fleet to start on the club line for the Cockwells sponsored series on Saturday 21st May 2016. Only 1 yacht turned out for Q class but it was great to see Stuart Higgins and his crew on Atalanta back out on the water. The wind off the club oscillated between West and South West but Stuart managed to fly his spinnaker on starboard pole soon after his 1355 start. 6 boats came out for U class and jostled for positions 5 minutes later. On Trifle we were short handed with myself and Sonny my 10-year-old nephew. We had chosen to fly a no 2 genoa as the wind looked strong in the roads. We chose the quay end of the start line and hit the line on the button. Trifle forged ahead of the other yachts and it was not until the very end of the moorings at Trefusis were we overtaken as the others were flying their spinnakers! Aries, David Mitchell came right up behind us with his sails gooswinged. He learned a quick and early lesson that Trifle's helm will luff hard to protect the weather side!! Water Tower to port was the first mark and Wilkie, Bob Chapple got an early Lead on Kaimana, Nigel and Jess Rowe. Aurora, Mandy Owens followed and was joined by Ida, Mike Swingler and Aries, Trifle was now tail end Charlie. The mark rounded we hardened up on port tack. We could see Wilkie ahead and Ida to leeward of her. The wind had freshened and our no 2 genny pulled us well. We were 5th around the buoy and set sail for Western near the castle. We slipped easily to leeward of Ida and rounded W to starboard in 4th place. Wilkie was ever increasing her lead and stood on to lee bow the tide across the narrows. Aurora in front of us tacked off and went down tide on a header. We were just pipped at the Governor buoy into 4th place again and set sail for St Just. The fuel oil ship went right through the middle of the fleet but full marks to the skipper who increased his revs to make the minimum of disturbance. Wilkie had now established a commanding lead with Kaimana slipping back a bit, Aurora rounded third and we duly followed. As the three leading boats rounded they all followed Atalanta, who had rounded ahead of them and went on port tack into the western shore. Against tide for a short while and into the lee of the fuel ship and a commercial ship anchored by the Crossroads buoy. On Trifle we made a conscious decision and tacked of onto starboard and went up the Eastern shore, into clear air and less tide. We lifted above the East Narrows buoy and got a lee bow on the tide. A tack onto starboard found us close to Kaimana and ahead of Aurora. We were third to finish. Wilkie, Bob Chapple was overall 1st place and although we beat Aurora by 2 min 56 seconds to the line the handicap put her in second place above us by a whopping 1 minute and 28 seconds! Two Working Boats came out to enjoy the nice breeze and short bouts of liquid sunshine. 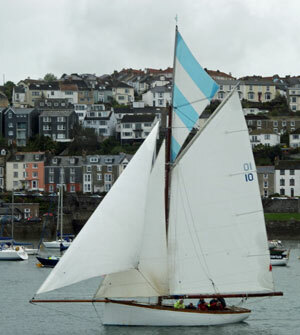 Winnie, Arthur Williams beat Florence, St Mawes Syndicate on handicap. They both looked resplendent in their brightly coloured topsails against an ever-brightening sky. Back to the clubhouse where Gaye Slater served us with teas and cakes. 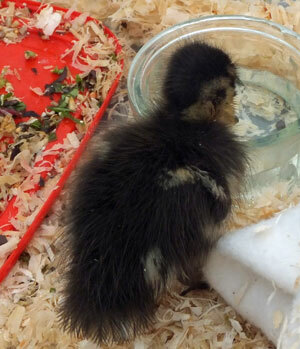 The Duck from last week has had the run of the clubhouse and thanks to Giles for his rescue efforts. Thanks to Sue Clark for the results and Jeannette and Inez in the ops room. Jack Penty for RO and our sponsors Cockwells.